Da Bears Blog | What can the Bears expect from Kevin White in his career? What can the Bears expect from Kevin White in his career? I recently looked at the recent history (2006-14) of 1st round wide receivers in their rookie seasons to see what it is reasonable to expect from Kevin White in 2015. Now I am going to look more closely at comparable players from that list to Kevin White based on his physical attributes and college production. 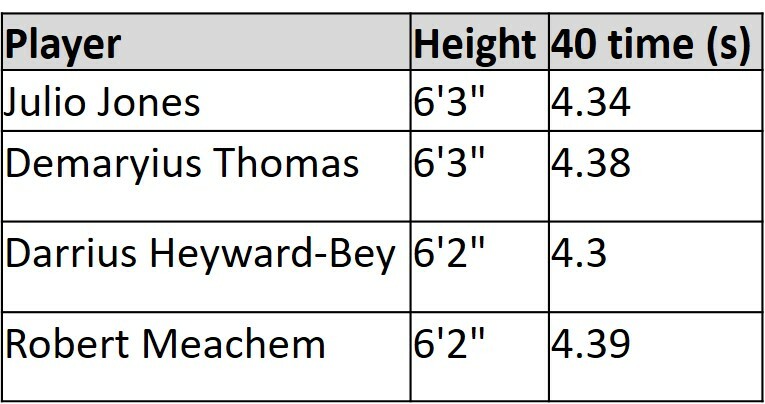 I put together a list of the height and 40 time of all 30 receivers drafted in the first round since 2006 (based on Combine measurements when available, Pro Day when needed). Kevin White measured in at 6’3″ and ran a 4.35 second 40 yard dash, so I looked for guys who measured between 6’2″ and 6’4″ and ran the 40 in 4.40 seconds or less as being similar to White. The full list, which is very short, is seen below. There are only four wide receivers who can roughly match White’s size/speed combo who have been drafted in the 1st round since 2006. That shows the rare traits White possesses, and the names Julio Jones and Demaryius Thomas show you just how high his upside is. Of course, players like Robert Meachem and Darrius Heyward-Bey show that this is no guarantee of stardom. I also looked at the college production of all the wide receivers drafted in the 1st round since 2006. Since one of the fears with Kevin White is that he only has one strong season of college production on his resume, I looked at their production in their best college season as well as their production in their 2nd best college season. Besides White, there were six players with at least 1,000 yards in their best season, less than 750 yards in their 2nd best season, and at least 400 yards difference between their best and 2nd best season. That list is provided below. Once again we see players who are stars and players who are busts, with very little in between. Of the six players with similar college resumes to Kevin White, two (Demaryius Thomas and Dez Bryant) have become NFL superstars, two (Kelvin Benjamin and Odell Beckham) are coming off big rookie seasons and seem headed to NFL stardom, while two (AJ Jenkins and Robert Meachem) never accomplished much in the NFL, though Meachem at least had a couple seasons as a solid role player. Looking at players with White’s combination of size, speed, and college production, we narrow it down even further. There are only two players who are comparable to White in both of the categories above: Demaryius Thomas and Robert Meachem. I think it seems reasonable to say those two serve as a baseline worst (Meachem) and best (Thomas) case scenario for White’s career. It’s also worth noting that neither player did much as a rookie. Thomas had 22 catches for 283 yards as a rookie, while Meachem spent his rookie season on injured reserve and only posted 12 catches for 289 yards in his sophomore campaign, but that is a very small sample size and does not mean for sure White will have such a small impact in his rookie season. Throughout his comparables we see the immense boom or bust potential that White possesses. Bears fans can only hope that he avoids busting, because he should be a superstar if he does.